IF YOU thought last weekend's Grand National with 40 runners was a baffling enough puzzle to solve, then what about the US Masters, with a field of 93 golfers? The first golfing major of the year, which starts soon after midday (UK time) in Augusta, Georgia today and finishes on Sunday night, has proved a bookmakers' benefit in recent years. But while it's difficult to pick the winner, it's not impossible task to make a wise selection for each-way bets. Depending on the bookmaker, they will pay out for fifth or even sixth place. As in the case of the National, adhering to a few simple rules can help push the percentages in your favour. First, go for a golfer with previous Masters experience and preferably one who made the cut in the previous year (the last 13 winners all did). 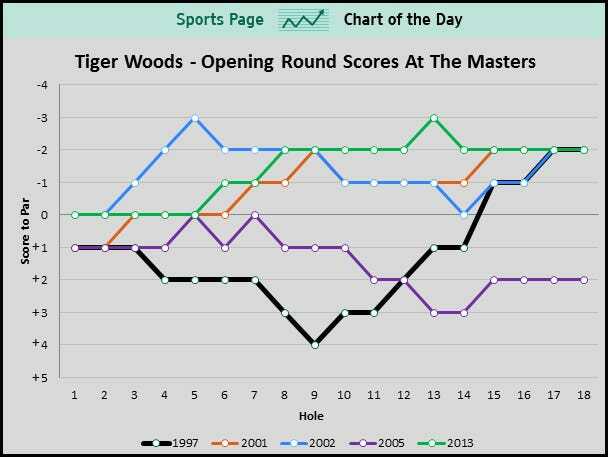 Augusta is a very tricky course, where accuracy is at a premium, and it's significant that no Masters debutant has won since Fuzzy Zoeller in 1979. Second, include at least one American in your portfolio: Stars and Stripers have won 57 of the previous 76 renewals. Of other nationalities, South Africans have a very good recent record: with two wins since 2004 and four second places. These South Africans have been available at mouth-watering odds: last year Louis Oosthuizen, who lost in a play-off, was available at 90-1. Europeans enjoyed a golden period in the event between 1980 and 1999 with 11 wins, but no European has won since. Time for a change this year? The Ryder Cup heroes won't be lacking in confidence. Third, don't be scared to back a golfer in his early 40s. Veterans do better at the Masters than at any other major and the likes of Nicklaus, Player, Crenshaw and O'Meara have all won in their 40s. But don't go for someone too old - the oldest winner remains Jack Nicklaus, who was 46 when he prevailed in 1986. The average age of the Masters winner is 32. Fourth, think about left-handers. It's a fascinating statistic that five of the last ten winners have been south-paws, a total which includes three wins for 'Lefty' Phil Mickelson and last year's winner Bubba Watson, who is back to try and retain his title. No left-hander has ever won the US Open and only one has ever won the British Open. TIGER WOODS. Age: 37. Country: USA. The red-hot bookies' favourite has a great record at the Masters with four wins between 1997-2005, and five top seven finishes in the past seven years. Woods will be bidding to win his first Major since 2008. Although he comes to the tournament in good form and is highly likely to be in the 'mix' again, his current odds of around 4-1 look mean bearing in mind the size of the field and the number of potential winners. PHIL MICKELSON. Age: 42. Country: USA. 'Lefty' has the best Masters record of them all since the turn of the millenium, with three wins and eight other top ten finishes. Last year he would have won again had he not made a Horlicks of a hole on the final round. If you're looking for a percentage each-way bet who looks sure to give you a run for your money, then Phil's your man. RORY MCILROY. Age: 23. Country: Northern Ireland. The Ulster starlet famously imploded when four shots clear in the final round in 2011, but bounced back from that disappointment to win the US Open. He's not been in great form in early 2013, though he did better in the Texas Open last week and if it all comes together, will clearly be a threat, though current odds of around 10-1 are hardly generous. LUKE DONALD. Age: 35. Country: England. Spent over a year as the world's number one golfer in 2011 and 2012 and has done well before at the Masters, finishing third in 2005 and 2012 and fourth in 2011. Despite his consistent record he's around double the odds of Justin Rose and over three times the odds of Rory McIlroy, but says he's happy to be 'under the radar'. LEE WESTWOOD. Age: 39. Country: England. Could this be the year 'Westy' finally wins his first Major? He has a fine record at Augusta, having finished third last year and second in 2010 and the only thing that has let him down has been his putting. If that can improve - and he's been practising hard on his short game - he has to have a good chance of breaking his duck in his last Major before he turns 40. IAN POULTER. Age: 37. Country: England. Like Westwood, Poulter has a solid record at Augusta - he hasn't finished worse than 33rd in the past eight renewals - but like his compatriot he has yet to win a Major. That said, he'll be full of confidence after his Ryder Cup heroics and can't be ruled out. JUSTIN ROSE. Age: 32. Country: England. He's at the perfect age to win the Masters, and having posted four top 20 finishes in the event in the past five years, his supporters will be hoping that this is the year when the world's number three gets to wear the Green Jacket. At odds of around 18-1 he should give each-way backers a good run for their money. NICK WATNEY. Age: 31. Country: USA. Has the right kind of profile for a Masters winner having made the cut in the last five years and finished in the top 20 in four of those years. At odds of 66-1 he looks well worth an each-way bet. MATT KUCHAR. Age: 34. Country: USA. Finished third last year and comes into the tournament in good form. He's a consistent performer who plays the percentages and is likely to be in the mix. He might just lack that little bit extra to win  but again, he makes a good each-way bet. BILL HAAS. Age: 30. Country: USA. Another 'dark horse' American well worthy of consideration as he ticks many of the right boxes. He made the cut in his three previous Masters and comes into the tournament in fine form. RICHARD STERN. Age: 31. Country: South Africa. Given South Africa's good recent record in the event, it would be wise to include in any betting portfolio a long-priced South African and some shrewd judges think Stern - currently around 125-1 - could be the one to back this year. He's been in good form in 2013, beating the 2011 Masters winner Charl Schwartzel by seven strokes in the Johannesburg Open in February. KJ CHOI: Age: 42. Country: South Korea. A veteran whose profile is similar to the surprise 2009 winner Angel Cabrera in that he comes into the event with plenty of respectable Masters performances to his name. Played well in the Texas Open last week and at 80-1 there are plenty of worse outsiders. KEEGAN BRADLEY. Age: 26. Country: USA. He's the USA PGA champion of 2011 who has been well fancied for this on the back of four top-ten US tour finishes in his past four starts. He finished 27th on his only previous Masters appearance last year, and his lack of experience in the event is the main concern: only six previous winners had two or fewer Masters appearances to their name. RYAN MOORE. Age: 30. Country: USA. Those looking for a really long-priced outsider might consider the former US amateur champion, available at odds of around 150-1. He has played well in each of the four occasions he has contested the event. Three strong drives into the early morning mist from three golf legends signaled the beginning of the 77th Masters Tournament on Thursday. Thanks for reminding me this is on TV now! I’m not really into golf but the Masters is an event worth watching!!! Yes, you are correct and most golfers would agree. Try this Interactive map of Augusta National Golf Club. This is an incredible tool, especially for those who have visited the course. I read Condi Rice played a strong round with Mickelson. Here's the WSJ article by Jason Gay where Phil compliments her game. By FR standards, we are all golf gentlemen/ladies today. Since he's never done anything to me and I have no envy of his fame, his wealth and his accomplishments, I wish him nothing but good will........Go Tiger! Good pick, he's playing quite well with three straight tournament wins this year. I'm thinking Justin Rose because he's played really well the past five Masters without a win and I think he's running 18-1 with the bookies. I agree, think he has to be the favorite. He's playing at a level that I never thought he'd play at again. My long shot dark horse is Johnson, either Zack or Dustin. Are would that be horses? BTW, watching this round on ESPN, it looks to me like Tiger has lost some upper body mass; he's not as ripped as he was several years ago. I'm watching on ESPN too. Such a beautiful venue. I've attended 11 Masters from the mid 70s to the mid- 1980s (seems like yesterday). The cameras do it justice in HiDef digital, much more than the old analogue tvs. Just saw Sergio push one right on 13 through the pine trees from where Phil made that amazing shot a few years ago. Couples is spanking the ball (-2)playing with Dustin Johnson who plays a little bit too much right-to-left for this course. The 14 year old kid is +2 through 15... unreal. I saw him on the practice range yesterday. Looks young and has no clue what he’s doing right now. Gonna be big though. I'll be honest with you, I gave up golf back around 1997 or so and the only reason I watch it is because of Woods. If he's not in the running, I don't watch it. But why do I like Tiger Woods? Because he shows the same emotions on the course that I can relate to: the anger after a bad shot, and the fist pump after a made putt. It drives me nuts when I hear folks criticizing golfers for any emotional display, as if golf isn't a sport where emotions should be released. Golf needs to evolve and change just as bowling has. Where once the bowlers were afforded silence, they now have fan participation on every roll. Basketball has no rule of silence when the free throw shooter is at the line in a tied game with only 2 seconds left in the game. The Masters is quite simply one of the best sporting events of the year. Hey, great to read you again, Baynative. We reconnect this spring over the Masters once again. Welcome. I like the masters because the course is like a huge green Cathedral (I’m in the high desert, so green is good). I wish the PGA would do something about the morons that shout idiotic stuff, and “Get in the hole!” that really diminishes the experience. Nice to see you again, TS. Green is good! 1. Dr. Mackenzie and I believe that no good golf hole exists that does not afford a proper and convenient solution to the average golfer and the short player, as well as to the more powerful and accurate expert. 2. We have always felt that the make-or-break character of many of the holes of our second nine has been largely responsible for rewarding our spectators with so many dramatic finishes. It has always been a nine that could be played in the low thirties or the middle forties.